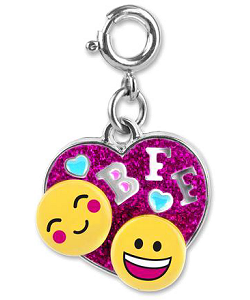 Celebrate the silly side of your BFF - Best Friends Forever - relationship with this adorable CHARM IT! BFF Emoji Heart charm. 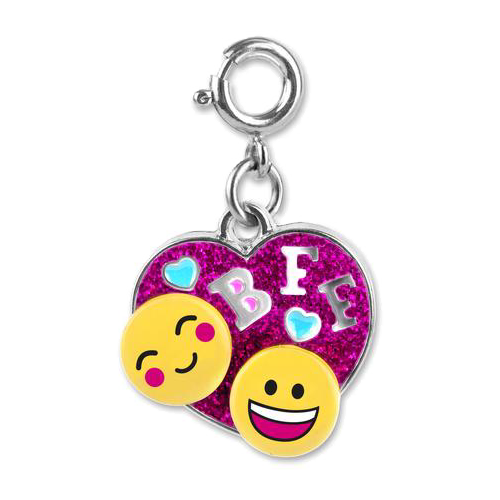 With smiling and grinning sunshine yellow emoji faces atop a silver-toned heart with BFF lettering, this fun best friends charm has a glittery hot pink background and two turquoise enamel hearts. With a simple snap of a clasp, you can share a special token of friendship and personalize your charm bracelet with this delightful CHARM IT! BFF Emoji Heart charm. This delightful Birthday Emoji charm has an oh-so-happy smiling face and confetti glitter birthday hat. This delightful CHARM IT! Emoji charm bracelet will have you Emoji smiling all day long! This two-sided Iridescent Star charm has a sweet emoji-smile with hearted cheeks on each side.